You’ve just started your new business. You want to get your brand and message out to the world – so you decide to put your business name on your company vehicles to build some brand recognition (great idea). The problem: the vehicles you have are all different colours, they don’t match the brand – it doesn’t work! Don’t worry, we can wrap your vehicles front to back and start building that brand. If your vehicle is blue but your brand colours are black and yellow, you can still match the vehicle to the brand. With a full vinyl wrap we can cover the entire vehicle to cover up the old paint. Your vehicle now becomes a billboard for your business and there is no hint of blue to throw it off. Whether you have a car, truck or minivan, by doing a full vehicle wrap you are opening up to a wide range of potential. If your brand focal matter is water you can now have water splashing from the front to the back. 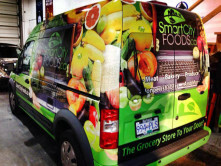 Maybe your business is in the food industry, why not cover your vehicle with brightly coloured fruit? These are eye-catching ideas because its not every day you drive down the street and see them. Our designers will work with your brand to come up with something creative and unique. If you are leasing a vehicle or are only looking for a temporary vehicle to wrap, the old paint job will always still be there. We use the best materials and processes to install and remove the full vehicle wrap. When we peel off the wrap, your blue paint job will be there like it was years before – untouched. Interested in how we can transform your existing vehicle into something awesome? Check out our full vehicle wrap gallery. Give us a call at 604-996-6389 out fill out our form below for a free quote. Whether you just want to change the color of your vehicle or put on a fantastic new design, we’ve got you covered!